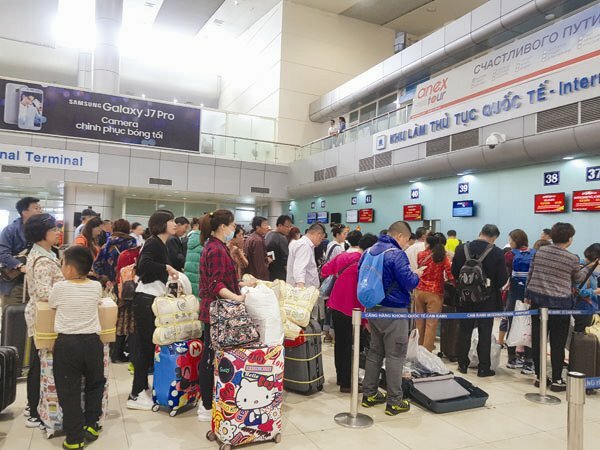 VietNamNet Bridge - The payment activities of Chinese travelers in Vietnam cannot be controlled, which is a high risk for Vietnam, experts say. The boom in Chinese travelers to Vietnam has made a great contribution to the increase of 30 percent in the number of foreign travelers to Vietnam in 2016 and 2017. While Vietnam’s state agencies are still busy calculating the average spending of foreign travelers to assess the impact of the tourism industry, a series of problems related to payment activities have arisen. In Vietnam, many Chinese do not pay cash for goods and services, but via Chinese e-wallets WeChat Pay and Alipay. The situation got even more complicated In November 2017. Vietnam’s Vi Mo JSC officially became the first payment intermediary that allows Chinese travelers to use WeChat Pay to make payments in Vietnam dong. As such, Chinese travelers in Vietnam don’t need to bring cash or Visa/Master Card debit/credit cards. With this payment mode, Vietnam cannot collect tax from trade activities carried out in Vietnam. More importantly, it is difficult to control the cash inflow/outflow to/from Vietnam. Experts have urged state management agencies to set up a legal framework powerful enough to control payment activities of Chinese travelers. The simplest solution suggested by them is asking WeChat Pay and Alipay to open payment accounts at Vietnam’s credit institutions. The activities of laundering money or transferring foreign currencies abroad cannot be controlled by the State Bank of Vietnam. If so, all the Chinese travelers’ activities of transferring money and making payments must go through Vietnam’s credit institutions. Only by setting this rule will the Vietnam’s Ordinance on Forex Management be observed. In late 2017, Alipay signed a cooperation agreement with Napas, the Vietnam national payment corporation, under which Alipay can serve Chinese travelers in Vietnam but it has not been licensed to work as a payment intermediary. However, experts believe that Alipay wants a bigger thing in Vietnam – providing payment service to Vietnamese individuals and businesses. This ‘piece of cake’ is very big as the two-way Vietnam-China trade turnover in 2017 reached $93.6 billion and the figure is likely to hit $100 billion in 2018. Vietnam is a potential market for Chinese e-commerce firms. The next steps to be taken by WeChat Pay and Alipay would be building and connecting the payment network with merchants in Vietnam. If so, the entire payment process from manufacturers and distributors to consumers will be completed. The process of Vietnamese enterprises importing goods from China and selling to Vietnamese consumers could be done on WeChat Pay and Alipay’s payment platform. By that time, the problem Vietnam has to deal with will not be fighting against dollarization, but ‘yuanization’.